Happy birthday to me this month: I chose a few trinkets. 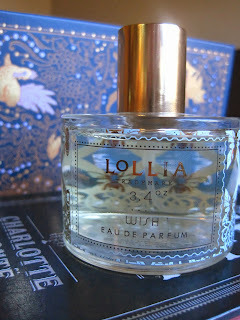 1) Lollia Perfume in Wish - I have one or two tiny perfumes from Lollia. Mainly I thought I would get this one for the pretty cylinder bottle. Then I brought it home and found that I love the scent. Along with the Happ & Stahns Rose Alba, it's now my favorite. It's sweet and innocent and magical, in a clean and fresh way. It's like a sugared flower petal, I suppose. 2) Disney & Green Notebooks - I love notebooks; I love Disneyland; I picked out the black DLR notebook and a blue Cinderella one that flips over to Aurora on the other side. The princess notebook is also a compromise with myself since I liked some of the t-shirts with a similar style, but didn't buy any because I knew I wouldn't wear them except at home. The green suede is from Anthropologie, and has two slits for storing a pencil. 3) Red Bracelet - A gift, this bracelet has alternating red and gold. Given that I have started wearing more bracelets lately, this is the perfect addition to my collection. 4) Wonderland Topsy Turvy Tea Blend - I fell in love with the Mad Tea Party Blend I got earlier this year, so I picked up the second flavor this time. Unfortunately, it is not as unique: it's basically Earl Grey. That said, however, it's still nice tea, I love that it's loose, I like the tin, and I am glad to find an option like this for sale at the parks. 5) Owl & Clock Necklace - Another gift, the little owl's wings open up to reveal a clock. I often prefer long necklaces, and this also pairs easily if I want to wear it alongside a shorter necklace. 6) Beauty & the Beast Picture - That's right, more Beauty and the Beast. While some of the Disney art these days can be quite quality, it doesn't always fit in with my style. This little frame, however, looked small enough to put on the wall with my other pieces without shouting "Disney merch." And it's Beauty and the Beast. 7) Hillywood Shirt - I don't like all of The Hillywood Show's shirt designs, so when there is a design I like, I try and get it quickly. Their first v-neck shirt has a simple, YouTube-esque logo. 8) Antique Writing Desk - I feel like Laura Ingalls Wilder with this desk. The top two pieces of wood fold away (to opposite sides, like a book) to reveal space for pens and ink and a flat space for writing. Here, the middle piece also folds back to reveal another compartment, which I believe was where you kept paper and perhaps letters. 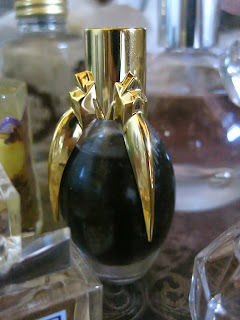 9) Lady Gaga "Fame" Mini Perfume - Here is why I save my Sephora points: sometimes there are very good things you can get with them. While this scent is too fruity/sweet for me, the bottle is cool and who wouldn't want to own the first black perfume? Plus, if I used it, then the bottle wouldn't look the same without its inky liquid. 10) R. Atkinson Fox's "Sunset Dreams" - Let me tell you the story here. Last November or December, when I was Christmas shopping at an antique store, I saw this print. I loved it, but left it there since I hadn't been planning on a purchase for myself. But I soon returned for it, only to find it gone. Then I went to a different store this weekend and found it again. We were meant to be. You'll have to forgive my poor picture of it: I haven't learned how to wrestle against reflections in glass. As you can see, I have been scattered of late, hence the slower pace of posting. Strange thing is, I would sometimes post more when I was supposedly so busy with college; the reason for this, though, was that I was always on the computer and would start posts while procrastinating on schoolwork. Anyway, today I am just doing a quick run-through of my Disney pin collection. I used to think I had a lot, until I saw one or two other pin collections. The only extreme thing about my collection is that, up until now, I have always worn all of them when visiting the parks. Yessir, that's two full lanyards on one five foot person. Come on, I'm used to wearing lots of necklaces, anyway. I used to keep the pins in order, but I've had to change that lately. I also used to just get one pin per day I spent in the parks. That changed. I got five pins just this last time because I was having so much fun and kept going back for more. Oh, yes, and one more thing: I never trade my pins. I know it's called Disney Pin Trading, but once I have a pin I've picked out, I don't want to part with it; they're my pins and I want to keep them. We'll start with the pink lanyard's top left side and go down, then back up. Then we'll do the same with the purple lanyard, aye? Next time I'm around, I'll need to get a third lanyard (I don't really want to put them in one of the pin books). And I'll have to choose just one lanyard's worth of pins to wear at once. The first pin is for the Jedi Training Academy, but I got it because I've been loving all the Star Wars pins around lately. Star Wars and Disney together? Yes, please--within bounds, that is. Next is the Tinkerbell pin, which is one of the first five I got, along with the Partners statue of Walt Disney and Mickey Mouse standing in front of the castle (classic Disney magic), the heart locket with Belle inside, the Pirates of the Caribbean dog with the ship in the background (Pirates was one of my favorite rides at this time), and the Cinderella pin at the bottom. Below the pirates pin is a celebratory circle for the 50th anniversary, during which I went at least three times. Then there is a little Matterhorn pin and the classic Disneyland sign pin, which I got this last time. Moving back up is a Narnia pin, which flips over to have Aslan on the back. Another meeting of worlds: Disney and Narnia. Then a little Minnie Mouse and a classic Mickey Mouse. Above that are the Tower of Terror, with a moveable elevator shaft, and the fire engine from Main St. Then there is the castle with a rotating background of fireworks. You can also see Mickey and Minnie dressed as pilgrims; I would have preferred a turkey pin, but I love Thanksgiving, so I had to get this one last week. I also picked up the two little button pins from a bowl on the counter: Snow White for classicism and the Mad Hatter for absurdism. On to the purple lanyard, beginning with another Star Wars pin that I got earlier this summer. It's Yoda looking up at a height limit sign and remarking about judging based on size; as a short person, I felt drawn to it, I suppose. Then the animated crew is riding on one of the trains (this is the same pin I put against Robyn Schneider's book a few days ago). Next come the Haunted Mansion and Mickey dressed as a magician, pulling Donald out of a hat. The next two are some of my favorites: the crocodile from Peter Pan, eating Captain Hook, and Mr. Toad, complete with a moveable car. Then come the Teacups, fully spinnable--this was one pin I remember wanting for a while. Another Matterhorn pin commemorate its 50th anniversary. At the bottom is a nice and big Tower of Terror pin, with Donald ushering you into the moveable doors. Alice and Company sit back in another Teacups pin, above which sits a Disneyland Resort passport for Mickey Mouse. California Screamin' has its own moveable car, and Mickey as the Sorceror's apprentice holds a 3D hat with magic inside. Above that is DCA's Storytellers statue of a younger Walt and Mickey, newly arrived in California. Then Maleficent advertises Fantasmic and the two Siamese cats from Lady and the Tramp pose together. I like those cats almost as much as the crocodile, so I was excited to find them even though their pin is flat and, as you can see, I much prefer 3D pin. Moveable parts, raised layers, and uniqueness are what I love. And pins take up much less space than other things you can buy at DL. It occurred to me that both E.T. and Hansel and Gretel deal with themes of children versus adults and hunger of some sort. To draw such a comparison is, I think, no more or less odd than what comparisons I usually make. Let's begin with the adults. I feel like Hansel and Gretel is one of those stories that most people know multiple versions of--most of the time we know that stories have multiple versions, but we're really only familiar with one or two. Red Riding Hood is probably the one we also all know multiple versions of. In Hansel and Gretel, sometimes the parents and children simply got separated; other times, they purposely left them in the woods. Sometimes they only left them temporarily, and sometimes they were trying to get rid of them. I think one version has the only the mother trying to get rid of them. The only version that this theme won't appear in so much is the one where the children get separated in an innocent way. One way to see a story about children getting lost is that children should stay with their parents to stay safe. But when there is something sinister or untrustworthy about the parents, then the theme switches. Children become innocent and adults . . . are not innocent. This is what reminds me of E.T. In the movie, there is a sort of "us and them" about children and adults, even though not all the younger crowd always get along and some of the adults turn out to be trustworthy or helpful. In both stories, a child's innocence is more accepting, whereas an adult's greater exposure to the world has a negative influence. Now on to the hunger. You've heard this interpretation of Hansel and Gretel, right? That it's a metaphor for gluttony or some such thing. The children are tempted by a house that they can eat, and the witch is a cannibal because she wants to eat them. You could, in turn, say that the theme of hunger is a metaphor for other types of hungers--like, say, the hunger of the scientists in E.T. They're not simply curious: they want to take control of everything and perform experiments and all that just to satisfy their hunger for knowledge and power. Like eating a house when you're hungry, there's a point where seeking scientific knowledge is justified--but there's also a line that you can cross to go too far. You can describe both of these stories as magical, disturbing, and symbolic, depending on how you look at them. That's what keeps the interest in them alive: they're up for interpretation.